The Bank of Japan will hold its first monetary policy meeting of 2019 on January 22-23, and unlike this time last year when there was a real prospect of a QE exit, policymakers will probably be discussing if or how to respond to the weakening outlook. There is no set time for the BoJ’s announcement on Wednesday, but the yen could come under some downside pressure if the Bank lowers its economic forecasts in its latest quarterly outlook report, due to be published on the same day. As dark clouds start to gather over the world economy, the start of 2019 is not proving a very cheery one for central banks. The BoJ, along with the European Central Bank, is still stuck with negative interest rates and even the Federal Reserve is mulling whether to pause its rate hike cycle. Although Governor Haruhiko Kuroda has been reiterating that the Bank has more tools at its disposal if additional stimulus is needed, investors doubt whether policymakers have any firepower left to respond to any fresh downturn. Markets’ attention on Wednesday will therefore be on how worried the BoJ is about the growing dangers of a recession and a further southward deviation of inflation from its 2% target. At the last meeting in December, board members had voiced concern that “downside risks to the outlook have been heightening”. And while there’s been relief that the Fed has since signalled “patience”, China has pledged more stimulus measures and there’s been some progress in US-China trade talks, the risks to growth and inflation are still clearly to the downside. Reports suggest the BoJ will cut its projections for inflation in its outlook report as weaker growth both in Japan and abroad, and lower oil prices are likely to drag on prices. However, the Bank is not expected to make or signal any changes to its policy at this point, as, despite all the gloom, there are a few positives in the Japanese economy. Business confidence remains at healthy levels and, apart from a tumble in the third quarter, capital expenditure has been growing solidly since the end of 2016. 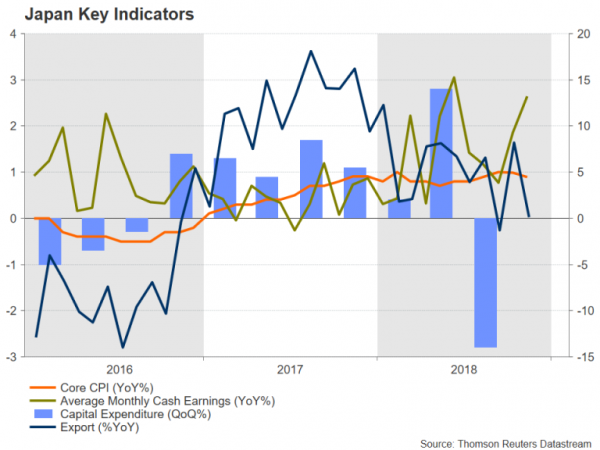 More significantly though, wage growth appears to be picking up again, reaching 2% year-on-year in November, and this could support domestic consumption should external demand soften further. In the currency markets, the yen could further retrace some of its impressive gains versus the US dollar since mid-December if the BoJ strikes a more pessimistic tone than what analysts are anticipating. Having last week broken above the upper level of its recent 107.75-109.20 trading range, dollar/yen could next target the 61.8% Fibonacci retracement of the downleg from 113.70 to 104.96 at 110.36. Clearing this hurdle could see the pair head for the 78.6% Fibonacci at 111.83. However, if the Bank of Japan maintains cautious optimism about the outlook, dollar/yen could slip below immediate support at the 50% Fibonacci around 109.33, which lies slightly above the top of the recent sideways range. Breaching this zone would bring the 38.2% Fibonacci into focus at 108.30, while failure to hold above this mark could pull the pair towards the 23.6% Fibonacci at just above the 107 handle.